rarely in the imperfect tense. This subjunctive was often accompanied in Latim by [illegible]. In modern French, it is generally introduced by [illegible], but, in Old French, all [conjunctions?] are, as a rule, omitted. However, the subjunctive id sometimes strengthened by [or? ], [lear? 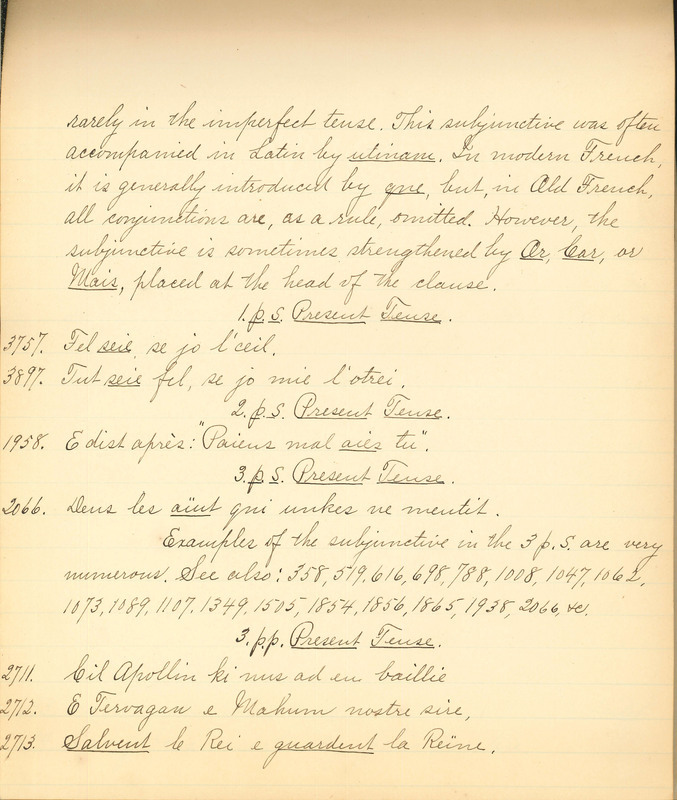 ], or [illegible], placed at the head of the clause. 1.P.S. Present Tense. 3757. Fel seie se jo l'ceil. 3897. [Ful?] seie [fel? ], se jo mie l'otrei. 2.P.S. Present Tense. 1958. E [illegible] après: "[Paieus] mal [illegible] tu". 3.P.S. Present Tense. 2066. [Lleus?] les [aünl?] qui [illegible] ne ]mentil?]. Examples og the subjunctive in the 3 p.s. are very numerous. See also: 258, 519, 616, 698, 788, 1008, 1047, 1062, 1073, 1089, 1107, 1349, 1505, 1854, 1856, 1865, 1938, 2066, [ie?]. 3. p. p. Present Tense. 2711. [illegible] [illegible] [illegible] [mus=] ad en [baillie?] 2715. E [illegible] e [illegible] nostre sire. 2713. [illegible] le Rei e [illegible] la Reïne.